In September 2013, Yorkshire Dance, in partnership with Breakfast Creatives and the University of Leeds, was chosen by Nesta, Arts Council England and Arts & Humanities Research Council as one of over 60 arts and cultural projects to receive funding from the £7 million Digital R&D Fund for the Arts. Each of the R&D projects is testing the use of digital technologies to widen audience access and engagement in the arts, with the purpose of developing useful products, services and knowledge for the wider arts and cultural sector. The Digital R&D Fund for the Arts is a fund to support collaboration between organisations with arts projects, technology providers, and researchers who want to use digital technology to enhance audience reach and/or develop new business models for the arts sector. The partnership planned to use the award of £125,000 to build respond_, a responsive online platform that would encourage audiences and the wider public to become more actively engaged in the creation and interpretation of contemporary dance. 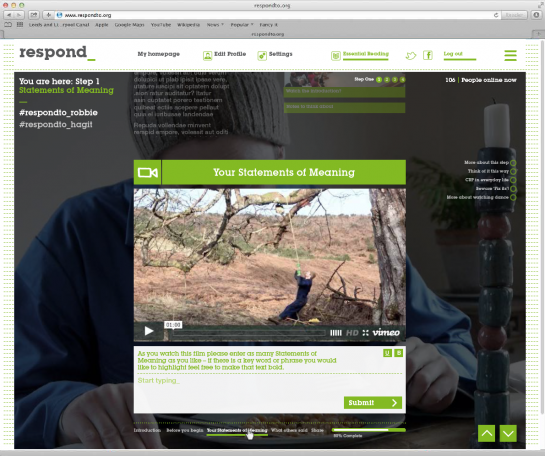 A digital adaptation of Liz Lerman‘s renowned Critical Response Process (CRP), the technology was designed to enable participants to interact directly with artists; share their feedback and interpretations of artistic ideas and works-in-progress; and exchange their ideas with others on the site. CRP is a feedback system based on the principle that the best possible outcome from a response session is for the maker to want to go back to work. Embraced by dance-makers, artmakers, educators, scientists, theatre companies, orchestras, science centres, museums and more, it has deepened dialogue between makers and audiences, enhanced learning between teachers and students and proved valuable for all kinds of creative endeavours and collaborative relationships within and beyond the arts. On Tuesday 21st January 2014, a panel of judges from Yorkshire Dance, Breakfast Creative and the University of Leeds, with Paul Russ (Director of Dance4) and Theresa Beattie (dance consultant, and previously Director of Artist Development at The Place) reviewed all applications and shortlisted to the final six. Some of the award money would be used to commission two new dance works which would be developed through the digital adaptation of CRP, and Yorkshire Dance put out an open call to dance artists at the end of 2013, inviting them to submit a digital ‘pitch’ for their planned new works. 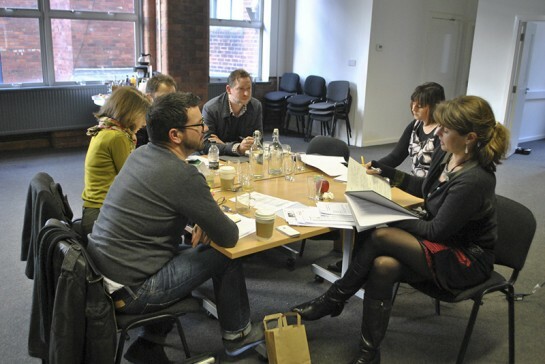 Dozens of short films were received, and in January 2014 a panel of judges from Yorkshire Dance, Breakfast Creatives and the University of Leeds, with Paul Russ (Director of Dance4) and Theresa Beattie (dance consultant, and previously Director of Artist Development at The Place) reviewed all the applications and shortlisted to the final six. The panel were encouraged by the standard and diversity of submissions and shortlisted projects proposed by Robert Clark, Jennifer Essex, Ben Duke, Sadhana Dance, Hagit Yakira and Robbie Synge. The six digital pitches were posted online at www.respondto.org and the public were invited to vote for two that they would like to see commissioned. Over 800 people from around the world voted, and selected Robbie Synge’s Douglas and Hagit Yakira’s Air Hunger. As Robbie and Hagit set about creating their new dance works, the respond_ team started to build the digital adaptation of the Critical Response Process, and in September 2014 respond_ was launched. Robbie and Hagit each made a short film, giving a flavour of their works-in-progress, both of which were posted online at www.respondto.org for a week. Hagit’s film was shared privately with a ‘Closed Group’ of 30 participants working closely with researchers from the University of Leeds. The group comprised a mixture of Frequent Attenders of Contemporary Dance performances (seeing more than four performances per year), Infrequent Attenders (seeing between one and four performance per year) and people who identified themselves as non-attenders (never seeing Contemporary Dance performance). Robbie’s film was made public, and anyone, anywhere in the world, was invited to watch it and join in the Critical Response Process as a member of the ‘Open Group’ of participants. • Questions from the Artist: Robbie and Hagit both posed a series of specific questions about their works for the participants to answer. • Questions from the Participants: the participants were given the opportunity to ask any questions about the work directly to the artists. • Offering Opinions: participants were invited to offer an opinion about the work – in the first instance offering only the subject of their opinion (for example, “I have an opinion about your use of costumes.”) The artists were at liberty either to accept or reject the opinion itself, depending on whether they felt opinions on those subjects would be genuinely useful to the creative process. If they accepted the subject of the opinion, respond_ would then deliver to them the opinion itself, to which they could reply. When the week of CRP came to an end, Robbie and Hagit both went back into the studio to develop Douglas and Air Hunger further, with all the questions, feedback and opinions from their respective participants in their heads. In the meantime, the respond_ team undertook an evaluation of the digital platform and of the practicalities of managing it during CRP – taking on the role of a CRP facilitator in a digital environment – and made a range of new developments to it. In November, Hagit and Robbie supplied new short films demonstrating how their works-in-progress had changed since September’s CRP. The films were posted online and a second week-long period of CRP was launched, this time featuring two live webchats, one between Liz Lerman herself and Robbie, and one between Liz and Hagit, to which online participants were also invited. The research team hosted a focus group with those who had participated in the platform and through survey data found that users had enjoyed the system of feedback that CRP offered but wanted to feel a part of a bigger online community. This considered, the team endeavoured to develop the platform to include discussion forums and a greater sense of a community. Also, those who frequently attend dance performances and participate in CRP reported that they found the platform less useful that those who do not usually attend contemporary dance who suggested that the platform had enabled them to gain insight into process and understand how contemporary dance is made and developed their understanding further. One of the biggest challenges facing the team was the plan to engineer Artificial Intelligence for the respond_ platform – to enable it, ultimately, to ‘learn’ how to facilitate CRP autonomously – and this is one aspect of the project which remains to be fully developed. During the first week of December 2014, both artists returned to Yorkshire Dance to complete Douglas and Air Hunger in time for their world premiere performances on Friday 5 and Saturday 6 December 2014 (Yorkshire Dance, Leeds). The Friday performance was sold out, and among the audience were a number of dance and other cultural professionals, producers, participants in the digital CRP, representatives of Arts Council England and the British Council and, of course, lots of contemporary dance lovers. A post-show conversation was held – effectively a high-speed CRP facilitated by Yorkshire Dance’s Artistic Director, Wieke Eringa – in which audience members, many of whom had participated in the digital CRP in September and November, expressed overwhelmingly positive reactions to both Air Hunger and Douglas. Among the Saturday audience, far fewer audience members had participated in the digital CRP but, again, the response to the two new dance works was very enthusiastic. Afterwards, Robbie and Hagit packed up, and this latest phase of the respond_ project was over. The research team has been busy analysing data gathered through observation and content analysis of the audience’s engagement with the platform and through qualitative feedback provided during a focus group, a series of surveys conducted throughout the programme, and depth interviews conducted with selected participants from the three user groups and with the two artists. Findings indicate that the process has enhanced participants’ engagement with contemporary dance, broken down barriers to attendance for non-attenders and changed the way that participants will provide feedback in future, both in the context of the arts and beyond. One participant described the platform as a welcome antidote to the immediacy of feedback encouraged by social media and to today’s ‘pundit culture’. For participants, the platform seems to have enabled the fostering of productive and empathetic relationships between audiences and artists and supported the understanding of contemporary dance-making processes within non-dance audience groups. Before the project reaches completion in March 2015, the project team are completing the final developments to the platform based upon the research conducted through the two phases of development. The team will be reviewing all of this information in order to make suggestions for how the platform enables engagement with contemporary dance and might contribute to decoding contemporary dance for non-dance audiences and enhancing their engagement with it. It is hoped that the respond_ platform can be applied to multiple contexts within and beyond the arts and employed by future dance makers to reach international audiences. Supported by the Digital R&D Fund for the Arts – Nesta, Arts & Humanities Research Council and public funding by the National Lottery through Arts Council England.